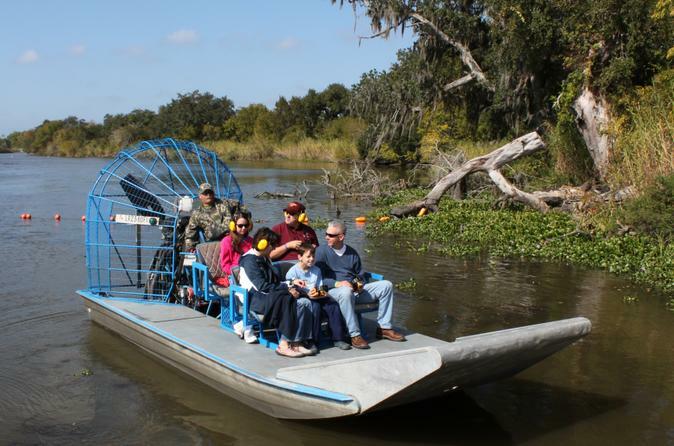 After pickup from your downtown New Orleans or French Quarter hotel, you’ll drive to a remote swamp in Cajun Country, located less than an hour away, for an exciting high-speed airboat tour. On the way, your friendly driver will provide entertaining stories and interesting facts about the region. Board a small airboat and relax as your professional driver takes you comfortably through marshes and deep into secluded bayous. On your 1.5-hour (roughly) airboat ride, hold on tight as the airboat reaches speeds of up to 45 mph (72 kph)! See abundant cypress trees, Louisiana’s state tree, and watch for native wildlife. After your airboat tour, you’ll return to your hotel.